Medicare is health insurance for people 65 or older, people under 65 with certain disabilities, and people of any age with End-Stage Renal Disease. It ensures that all seniors have basic hospital insurance (Part A) at no cost to them. It also provides the option of medical insurance (Part B). 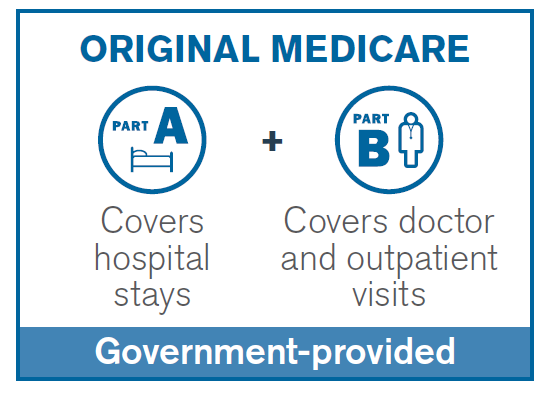 Part A & Part B make up what is called Original Medicare. Part A comes at no cost to the senior. Part B does involve a monthly premium that’s generally automatically taken out of Social Security. There are 4 parts of Medicare. These include Part A, B, C, and D. These are explained more in depth under Parts of Medicare. Most beneficiaries will pay nothing for Medicare Part A. We all pay taxes during our working years that are specifically for our future healthcare coverage during retirement. These taxes go to offset the cost of Part A later on. As long as you have worked for 10 years (40 quarters) in your lifetime in the United States, you will generally pay nothing at all for Part A. If you or your spouse have not worked 10 years in the U.S., the monthly premium for part A is up to $422/month in 2018. People with less than 40 quarters work experience but more than 30 quarters can get a pro-rated premium. The majority of Americans will pay the standard monthly amount set by the government. In 2018, this is $134.00/month for most people (or higher depending on your income). However, some people who get Social Security benefits pay less than this amount ($130 on average). The above Medicare structure covers the basics for some seniors, but leaves many with high out-of-pocket costs. Private insurance companies offer Medicare Advantage Plans and supplemental plans to alleviate the financial burdens imposed by relying solely on Part A & Part B for senior health care coverage. These private plans charge a monthly premium and can offer coverage that protects financial assets in the event medical services needed are not covered by Original Medicare coverage. We work with many seniors and their families to understand Medicare options and provide cost breakdowns and comparisons so that they can make an informed and wise choice about Medicare plans and supplements when open enrollment hits.